Sorry-in-the-Vale is a small, sleepy town in the Cotswolds, one of the most beautiful areas of countryside in England, which has been around for at least seven hundred years. 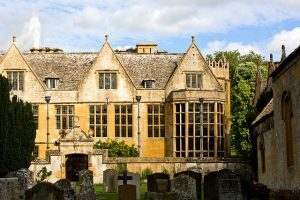 The streets and buildings are made of Cotswold stone, which is pale gold in color. The Sorriest River runs silvery smooth through their town: the woods circle the valley where their town lies. It’s quiet there, and peaceful: the children’s skipping song can be heard for miles. Casting a long shadow on the hill above their town is Aurimere, the manor house. The Lynburn family lived and ruled the town from there for centuries… until they all disappeared eighteen years ago. Now they have come back, but both the Lynburns and Sorry-in-the-Vale have changed. Screams are being heard in the woods again. The Lynburns have returned, and someone wants the old ways to return with them. Kami Glass has always lived in Sorry-in-the-Vale, has always heard an imaginary boy’s voice in her head, and has always wanted to be an investigative journalist. Now she’s finding out there is a lot about her town she never knew, the imaginary boy is a real life Lynburn, and she must uncover the secrets of the Lynburns and Sorry-in-the-Vale at any cost.